This bountiful relationship combines Sagittarius’ gift for expansion with Cancer’s gift for nurturing. Together, these two can create a rich partnership full of non-stop comfort. 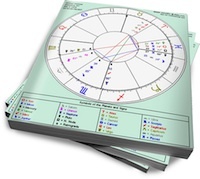 But tension will crop up when Sun in Sag’s desire to explore clashes with Moon in Cancer’s homebody tendencies. Sun in Sagittarius is all about going big. Whether he’s doing something extravagant for his partner or planning his next trip, he approaches life with high-octane optimism and possibility. Sun in Sagittarius sees no reason why he can’t have it all, but this is not due to pride or entitlement. He simply sees opportunity everywhere. His lover will surely appreciate his buoyant approach, but it’s best if she understands that he’ll always be looking for more. This doesn’t mean that he can’t commit, but he will need some freedom (and challenges) to maintain his interest. Moon in Cancer needs a home. While this may be true for most people, it is absolutely essential that she has a safe place to retreat to. Her home will be the center of her universe, and her lover should accept that this is where she’ll call the shots. Moon in Cancer will mother her partner, but she’ll require nurturing in return. Highly sensitive (and moody), it doesn’t take much for her to retreat into her shell if she feels unsafe or unneeded. Sun in Sag will enjoy Cancer’s full-on style of care (rich food and frequent cuddles). He has no use for half-way measures, so he’ll encourage her to open up and be a capital M Mother, while giving her extravagant gifts or praise. Moon in Cancer will blossom under Sag’s enthusiasm, but she’ll also feel uneasy with his urge for adventure. She’ll want to spend a quiet night in, and he’ll get bored with this after awhile. Sag may overlook Cancer’s simmering discontent, and Cancer may feel wounded by (what she perceives as) Sag’s insensitivity to her needs. They can make it work, but Sagittarius will have to pay attention to his lover’s need for quiet time, and Cancer will have to realize that even if Sag isn’t hovering over her, he still cares.